Breast-feeding, anesthesia and analgesics: What’s safe? Breast-feeding is safe even just after moms have woken from anesthesia or while they take most pain medications, says Sarah Reece-Stremtan, M.D., lead author of an expanded protocol about the topic. 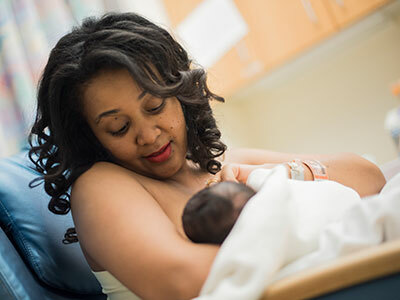 Moms can safely continue breast-feeding even just after waking from anesthesia and while taking most pain medications, according to a newly expanded clinical guidance, “Clinical Protocol No. 15: Analgesia and Anesthesia for the Breastfeeding Mother,” from the Academy of Breastfeeding Medicine (ABM). In general, mothers who are beyond the postpartum stage do not need to avoid breast-feeding or to pump and discard breast milk while taking analgesics or receiving local or general anesthesia. The protocol was published in the journal Breastfeeding Medicine. Sarah Reece-Stremtan, M.D., an anesthesiologist and acute pain medicine specialist at Children’s National Health System, co-chairs ABM’s protocol committee and is the lead author of the expanded protocol. A specialist in the intersection of anesthesia, pain medicine and breast-feeding medicine, Dr. Reece-Stremtan led the drafting of the recommendations. The protocol recommendations cover pain medications, brief procedures, regional and general anesthesia and perioperative considerations. They provide more granular detail about specific anesthesia and analgesic agents. For each recommendation, the protocol notes the strength or weakness of the evidence base. The authors note there is little rigorous information in the scientific literature about anesthesia or procedural sedation in breast-feeding mothers. “For obvious reasons, it is unethical to conduct randomized, controlled clinical trials for this area, so we rely on expert opinion and on observational studies that do exist,” says Dr. Reece-Stremtan. The protocol is intended to be relevant to a broad range of medical fields, from anesthesiology to general pediatrics, and to help any physician who may care for a new mother. For instance, it includes a perioperative plan with suggestions that surgeons or physicians can share with their patients to make things easier for a breast-feeding mom who needs local or general anesthesia – and safer for their babies. “It’s important to acknowledge that medication isn’t the only or even the most important thing,” says Dr. Reece-Stremtan. Tips to aid breast-feeding can ease the minds of mothers and their physicians alike. Dr. Reece-Stremtan has long been interested in breast-feeding and has seen a need for more education about where her areas of expertise, pediatric anesthesia and pain medicine, intersect. Few physicians specialize in this area, so she often gives talks to other clinicians on the topic. In developing this new set of recommendations, ABM’s protocol committee aimed to provide practical clinical guidance for two scenarios: Postpartum, and moms and babies who are past that stage. The committee divided a previous ABM protocol into these two areas and expanded them to offer clinicians more complete guidance that is clinically relevant yet concise. Dr. Reece-Stremtan attributes this expansion to a growing appreciation of the importance of breast-feeding to both individual and public health. She is helping to finalize ABM’s new birth-postpartum protocol on anesthesia and analgesics, which will be published in early 2018. To build on these protocols, Dr. Reece-Stremtan is helping the Academy develop a set of free patient education materials that will inform mothers about the use of pain medications or the need for anesthesia while breast-feeding, so they can feel at ease that they are doing the best thing for their baby’s health. https://innovationdistrict.childrensnational.org/wp-content/uploads/2018/02/baby-in-arms.jpg 300 400 Innovation District https://innovationdistrict.childrensnational.org/wp-content/uploads/2018/11/idlogo1-tagline-Advances-in-Medicine.gif Innovation District2018-02-21 10:22:452018-02-21 10:25:49Breast-feeding, anesthesia and analgesics: What’s safe? Critical white matter structures in the brains of babies born prematurely at low birth weight develop more robustly when their mothers breast-feed them, compared with preemies fed formula. Breast-feeding offers a slew of benefits to infants, including protection against common childhood infections and potentially reducing the risk of chronic health conditions such as asthma, obesity and type 2 diabetes. These benefits are especially important for infants born prematurely, or before 37 weeks gestation – a condition that affects 1 in 10 babies born in the United States, according to the Centers for Disease Control and Prevention. Prematurely born infants are particularly vulnerable to infections and other health problems. Along with the challenges premature infants face, there is a heightened risk for neurodevelopmental disabilities that often do not fully emerge until the children enter school. A new study by Children’s National Health System researchers shows that breast-feeding might help with this problem. The findings, presented at the 2017 annual meeting of the Pediatric Academic Societies, show that critical white matter structures in the brains of babies born so early that they weigh less than 1,500 grams develop more robustly when their mothers breast-feed them, compared with preemie peers who are fed formula. The Children’s National research team used sophisticated imaging tools to examine brain development in very low birth weight preemies, who weighed about 3 pounds at birth. They enrolled 37 babies who were no more than 32 weeks gestational age at birth and were admitted to Children’s neonatal intensive care unit within the first 48 hours of life. Twenty-two of the preemies received formula specifically designed to meet the nutritional needs of infants born preterm, while 15 infants were fed breast milk. The researchers leveraged diffusion tensor imaging – which measures organization of the developing white matter of the brain – and 3-D volumetric magnetic resonance imaging (MRI) to calculate brain volume by region, structure and tissue type, such as cortical gray matter, white matter, deep gray matter and cerebellum. White matter lies under the gray matter cortex, makes up about half of the brain’s volume, and is a critical player in human development as well as in neurological disorders. The increased white matter microstructural organization in the cerebral and cerebellar white matter suggests more robust fiber tracts and microarchitecture of the developing white matter which may predict better neurologic outcomes in preterm infants. These critical structures that begin to form in the womb are used for the rest of the person’s life when, for instance, they attempt to master a new skill. The American Academy of Pediatrics endorses breast-feeding because it lowers infants’ chances of suffering from ear infections and diarrhea in the near term and decreases their risks of being obese as children. Limperopoulos says additional studies are needed in a larger group of patients as well as longer-term follow up as growing infants babble, scamper and color to gauge whether there are differences in motor skills, cognition and writing ability between the two groups.